This convenient multipack contains three different varieties of tuna in broth, so you can vary your cat’s meals. One pack contains the flavours Tuna Fillet & Pacific Prawn, Tuna Fillet & Sea Bream and Tuna Fillet & Anchovy. 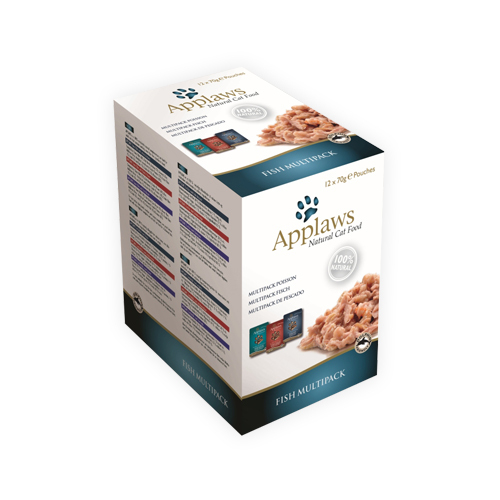 This Applaws wet food is available in convenient 70-grams portion packs. Each pouch is packed with different kinds of fish and rice. These ingredients combined with the broth make a delicious meal for your cat. Each pouch is a natural source of taurine. This nutrient supports the condition of the eyes and is beneficial for the heart. This multipack is a combination of three different flavours. Tuna Fillet & Pacific Prawn: Tuna fillet (55%), fish broth (23%), Pacific Prawn (20%), rice (2%). Tuna Fillet & Sea Bream: Tuna fillet (70%), fish broth (23%), sea bream (5%), brown rice (2%). Tuna Fillet & Anchovy: Tuna fillet (60%), fish broth (28%), anchovy (5%), seaweed (5%), rice (2%). Have you used Applaws Cat Food - Fish in Broth Multipack before? Let us know what you think about this product.